Composed by Larry McCabe. Squareback saddle stitch, Country, Improvising/Licks, Rock. Qwik Guide. All styles. Book/CD set. 88 pages. Mel Bay Publications, Inc #21142BCD. Published by Mel Bay Publications, Inc (MB.21142BCD). ISBN 9780786650712. 5.5 x 8 inches. 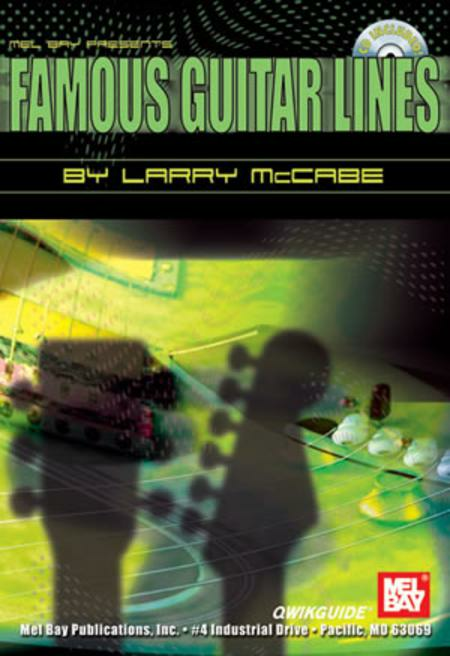 Famous Guitar Lines is a fun-to-use book, jam-packed with vibrant and varied licks. The book enables the emerging guitarist to develop self-confidence, fingerboard awareness, and technique all at the same time. 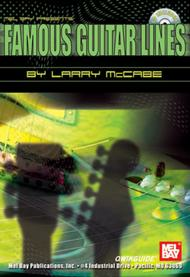 This collection of lead lines (notation and TAB) is ideal for all beginning to early intermediate lead guitar players. All licks are offered in a compact, 'bite-size' format, thus removing the frustration many guitarists experience when trying to play the pyrotechnical, impossible, longer-than-a-boring-sermon solos that clutter the popular guitar magazines. All examples are included on a companion CD, and recorded in stereo at a friendly, not-too-fast speed by a professional band.